Ever seen a lake covered with green algae? Or a coastline with strange, red streaks along the water? If not, I don’t blame you, the sight is quite rare. Maybe you’ve seen large patches of the stuff along the water, big but not quite so much so that it covers the surface. Either way, with changes in farming practices over the last ten to twenty years, the anomaly is starting to become more common. And, if you’ve ever seen the piles of dead fish that come with this green algae, or heard about any of the much maligned “red tides” near Florida, then you likely already know that this might be something to look further into. My first experience with eutrophication occurred before I even knew what it was. When I was younger, around eleven years old or so, my family took one of many trips to the zoo. I don’t quite remember which one it was (we’ve been to quite a few over the course of my life) and I only remember one thing about it. We were walking through the zoo, heading towards another exhibit, when we passed by to me what seemed like a sea of green. At first glance, it almost looked like a turf field. But, upon further inspection (and the sighting of some mallards at the edge of it) I noticed that it wasn’t a field, but in fact a pond, covered with something green. It looked harmless enough. It wasn’t until a few years later that I learned about what I had actually seen. The green covering the pond wasn’t fake grass, but instead a certain form of algae. What’s more: the algae wasn’t exactly natural. Turns out that it was all there due to a human-caused phenomenon, today known as eutrophication: a cold, seemingly innocent killer. What I didn’t quite understand five years ago, however, was that what I witnessed was actually quite deadly. 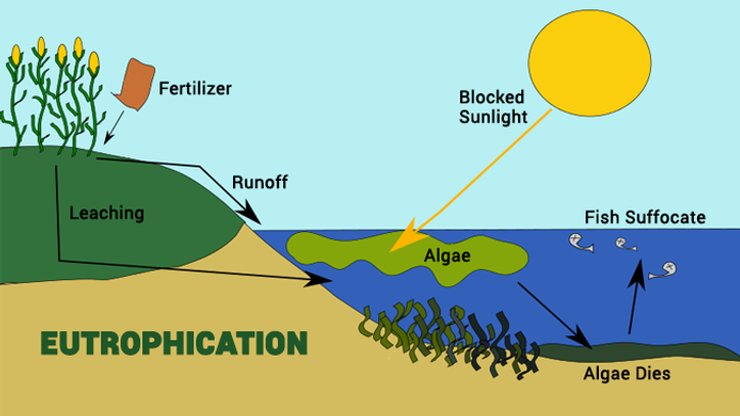 You see, eutrophication is essentially a build-up of algae in a particular body of water. They can be so big as to completely cover the area, like I saw at the zoo, or more spread out (like as its more commonly seen on coastlines). If this algae didn’t affect anything around it, then it wouldn’t be a problem. But, of course, I wouldn’t be talking about it if there wasn’t a problem. When levels of algae become this high, they begin to steal nutrients from other organisms that need them, namely fish and other underwater plants. Essentially, plants release oxygen only when they are producing energy, or photosynthesizing. The purpose of photosynthesis is not to generate this oxygen, but to produce energy in a form that the plant can use (oxygen only being a byproduct of the reaction). Anytime the plant isn’t making energy, it’s consuming it. In fact, it consumes it in the same way we do. Not by breathing, necessarily, but through cellular respiration: taking in oxygen, and using it to break down the carbohydrates (the source of energy) made through photosynthesis. Obviously, they normally produce enough oxygen to exceed out what was taken, but in ponds, lakes, or coastlines, this isn’t the case. Whenever the the nutrient levels decline (as they often do in eutrophicated waters), the water becomes too murky, or the water temperature becomes too high or low, the plants begin consuming oxygen. And, with millions upon millions of algae molecules all consuming oxygen at the same time, there isn’t enough to go around. At the same time, when the algae dies, the process of decomposition uses more oxygen. The end result of this entire process is what we call a “dead zone”. Because the excess of algae has stolen all available nutrients and oxygen that other organisms could have used, the plants and animals have no choice but to die off. In fact, it’s not uncommon to see piles of dead fish on top of or nearby eutrophicated lakes: they’ve got nowhere to run to, and no way to survive. Additionally, once the nutrients and oxygen are all gone, the algae starts to die off too. And, in such large quantities, a lot of carbon dioxide is released into the atmosphere, which we know makes matters a whole lot worse when it comes to problems such as climate change and ocean acidification. It should be noted that eutrophication is a normal process. Excess nutrients found in things like manure occasionally find their way into water every once in a while. But, now that humans have started to use nutrient-laden fertilizers in their farms, the problem is becoming much worse, and much more widespread. Whenever it rains, these nutrient fertilizers are washed off of farms across the country, and run off into rivers, lakes, and even major coastlines. As such, we’ve begun to see eutrophication occur more frequently, with more dead zones popping up. And with more dead zones comes more dead fish and plants, meaning that we and other animals have less food to use too. And with less food comes less animals, and less humans. Suddenly, that green algae I spotted five years ago doesn’t seem nearly as harmless. Eutrophication may not be a problem of such importance as climate change, but if left unchecked it could very well escalate into something on a similar level. I talked very briefly about what exactly contributes to the problem, but there’s more to be said here. There’s something other than fertilizer that contributes to the problem, and it’s a little bit more, well, uncomfortable to talk about. But, when learning about environmental issues, we must leave no stone unturned if we ever hope to solve these problems. Plus, there are a whole bunch of ways we can help limit eutrophication, even if you don’t own a farm. All of that we will get to next week, when we talk about the role our hair plays in the process of eutrophication.